WASHINGTON D.C., October 7, 2010: A comprehensive report examining the minute-by-minute versions of the same events during the Gaza-bound Freedom Flotilla attack by Israel was released by two charity groups today. Contrasting passenger testimonies against official Israeli accounts side-by-side to each other, a complete picture can be seen as to exactly what transpired in the days and hours leading up to the incident as well as its aftermath. 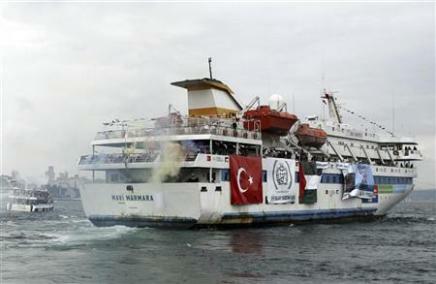 Conclusions show that Israel clearly manipulated evidence to bolster its argument that the attack on the Mavi Marmara was in self-defense against armed violent activists. Using second-by-second analysis, the reports shows how the six passengers killed were victims of execution-style murders by the Israeli soldiers. It is typical for America to suddenly wake up to an issue that has been around for, well, forever. Today it is bullying. But there can be little surprise that America has a bully problem. American policies around the world have been marked and characterized by bullying, as one would expect from an empire, even an empire that likes to see itself as spreading freedom and democracy. Bullying in America is hailed and glamorized as heroism so really, what kid wouldn’t want to be a bully? One bully that has gotten America by the, well, where it hurts is AIPAC. Everywhere you go you hear people complaining that nothing can be done to curb Israeli violence and brutality because this fierce all powerful lobby called AIPAC. Nowhere is this heard more than our nation’s capital Washington DC. In AIPAC’s website they make the following claim: “From a small pro-Israel public affairs boutique in the 1950s, AIPAC has grown into a 100,000-member national grassroots movement described by The New York Times as “the most important organization affecting America’s relationship with Israel.” Wow! I recently spent a weekend in DC and I heard two stories that exemplify the odd relationship between the world’s only superpower and this omnipotent organization, and that this has been going on for close to forty years. The first story takes place during the Carter administration when an attempt to put together a meeting between President Carter and one of the worlds leading Jewish leaders, Dr. Nahum Goldman was unsuccessful. When a mutual friend of Carter and Dr. Goldman, who told me this story, inquired with the President about this the President replied that a meeting with Dr. Goldman is not possible because Dr. Goldman really gets American Jews agitated. Dr. Nahum Goldman was one of, if not the most important Jewish Zionist leader in America. He was a staunch Zionist his whole life and was the Co founder of the World Jewish Congress, which he led for several decades. But Goldman’s brand of Zionism was not palatable for Israeli leaders such as David Ben Gurion, Golda Meir and well, the rest of Israeli politicians because Goldman tried to negotiate between Israel and the neighboring Arab states. He committed the crime of being critical of Israel for what he saw as an over-reliance on military might and for not making concessions after the 1967 Six-Day War. He further brought upon him the wrath of Jewish zealots by advocating a position that the only chance of long-term survival for Israel was to accept the rights of the Palestinians as a people. So how can the President meet with such a man? Fast forward to today’s Washington DC. A young non-Jewish Ivy League graduate member of a DC think tank proposes to present a paper on the Palestinian perspective. She lived and reported from Palestine, she has first hand knowledge and a deeper understanding of the situation than most experts. After a long wait the paper is shelved fearing it will bring about too much debate and that it is one sided. Well, by presenting the perspective of a particular side of the conflict the paper was by definition one sided and as for creating debate, isn’t that what a think tank is supposed to do? I have learned that on a local level agents of this ridiculous bully follow me and my activism quite closely. Self proclaimed keepers of the most zealous and uncompromising brand of Jewish nationalism have taken it upon themselves to attend, record, film and conduct classes on the things that I say about the heinous crimes and viscous attacks committed by Israel against the Palestinian people which it rules. I am not sure if I should be flattered or afraid. I mean, after all will they report me to the authorities? Will they deny me entry to Israel or the US? But of course I then recall that other than being a self-proclaimed policing force that refuses to see the ridicule and the tragedy in its positions and its actions these little bullies are really nothing. Local elected officials are offered great trips to Israel, free of course. Happily the ones I know stood up to this bully and the favors it offers and refused the gift on grounds that it is wrong for an elected official to receive such expensive gifts. Besides, no gift of this kind is free. It comes with the expectation of future support for Israel’s draconian policies regarding the Palestinians. It is said that AIPAC itself has the power to dethrone powerful people. That it is a king maker as well as a killer of political careers, even well established careers. But I have yet to hear an explanation as to why. Why is it that this organization and its self-righteous agents yield so much power of extortion over the world greatest power? What secrets do they posses that can yield such powers of extortion? While in DC I had the pleasure of meeting one man who is rather close to the President himself. He works with the President on issues other than the Mideast but when we met the Mideast we talked mostly about the Middle East. “Perhaps you over estimate the power of the President” is what this man said to me. If President Obama said one sentence that truly relates to the horrors of Israeli policies, if he made one comment to criticize Israeli human rights violations or the treatment of Palestinian minors in Israeli prisons, if he publicly said what he surely knows, that Israeli insistence on building settlements for Jews only on land that belongs to Palestinians is wrong or even, God forbid that he should say that the situation in Gaza is unacceptable (not unsustainable as he said in the past). If the President says just one of theses things it would get the ball rolling sparking a serious debate and it will embolden others to ask these questions and make demands of Israel. Far from me to suggest that politicians align themselves with what is right and what is just. However, those politicians who do care need to know the following: there are ways to stop bullies but succumbing to them and appeasing them are not included. To stop bullies one needs to stand up to the bullies and to make it clear that we will not take their BS!